The only available teaching model that permits the practice of placing Peripherally Inserted Central Catheter Lines (PICC Lines). 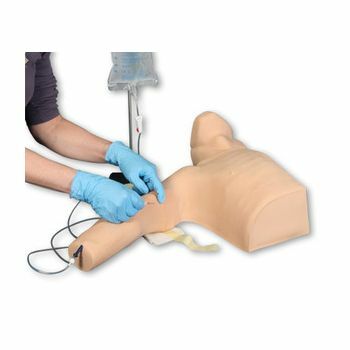 The rapid acceptance and increased use of PICC lines creates a need to be able to properly teach this procedure. Peter PICC Line allows the teaching, practice and assessment of this insertion technique. 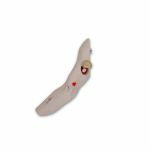 This portable teaching model has a replaceable translucent arm skin that allows the visualization of the underlying cephalic, basilic and median basilic veins which are presented as barely visible blue veins. The superior vena cava, subclavian, axillary and jugular veins are also present, plus a movable chin that simulates the occlusion of the jugular to prevent the PICC Line from traveling this route. Proper placement can be confirmed by viewing the distal tip of the PICC in the viewable superior vena cava on the side of the model. Comes with removable ribs with overlying tissue pad. The ribs are palpable and, with the landmarks on the chest, permit the practice of measuring catheter length to the correct intercostal space. The life-sized model permits the supplies needed for a PICC insertion to be laid out and sterile technique taught as well as practiced. A great tool for teaching, training, competency testing and skills assessment. 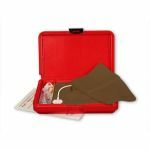 Includes a durable zippered, padded, carrying case with handles and a zippered supplies pouch.NOTE: Blue veins are made of natural latex Size: 17" x 22" x 5.5" Sh. wt. 12.0 lbs.